Researchers have also shown that Wormwood (Artemisia annua) inhibits both malaria and dengue fever - two of the most lethal mosquito-borne infections around the world. Der Medizin-Nobelpreis geht in diesem Jahr 2015 an drei Wissenschaftler für die Erforschung von Malaria, Flussblindheit und Elefantiasis. Die eine Hälfte erhält die Chinesin Youyou Tu. Die chinesische Pharmakologin Youyou Tu schuf mit ihrer Arbeit sie Grundlage, die Malaria weltweit mit einer wirksamen Arznei bekämpfen zu können. Ihre Forschung ist von einer Heilpflanze der traditionellen chinesischen Medizin inspiriert: Aus Artemisia annua, dem Einjährigen Beifuß, gewann sie die Substanz Artemisinin, die gegen Malaria wirksam ist. Die Wissenschaftlerin hatte in den siebziger Jahren gezielt nach pflanzlichen Wirkstoffen gegen die schwere, fieberhaft verlaufende Tropenkrankheit gesucht. Mehr als eine halbe Million Menschen sterben jedes Jahr an Malaria, die meisten von ihnen Kinder. Nach Angaben der Weltgesundheitsorganisation (WHO) bekommt in Afrika noch immer nur eines von fünf kranken Kindern Medikamente gegen Malaria. AFP Die chinesische Pharmakologin Youyou Tu wurde in ihrer Arbeit von einer Heilpflanze der traditionellen chinesischen Medizin inspiriert: Aus Artemisia annua, dem Einjährigen Beifuß, gewann sie die Substanz Artemisinin, die gegen Malaria wirksam ist. A team of medical doctors in RDCongo, Jerome Munyangi and Michel Idumbo, have run randomized clinical trials on a large scale in the Maniema province with the participation of some 1000 malaria infected patients. The trials were run in conformity with the WHO procedures and compared Artemisia annua and Artemisia afra with ACTs (Coartem and ASAQ). 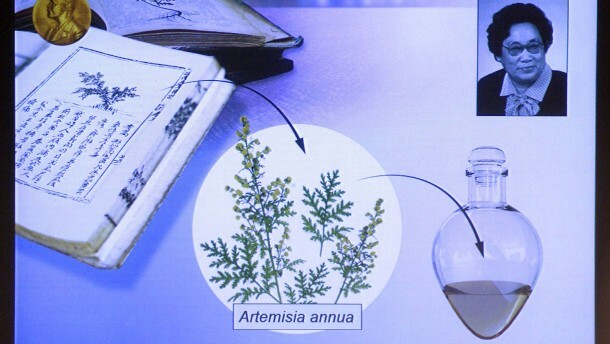 For all the parameters tested herbal treatment was significantly better than ACTs: faster clearance for fever and parasitemia, absence of parasites on day 28 for 99.5% of the Artemisia treatments and 79.5% only for the ACT treatments. A total absence of side effects was evident for the treatments with the plants, but for the 498 patients treated with ACTs, 210 suffered from diarrhea, and/or nausea, pruritus, hypoglycemia etc. The efficiency was equivalent for Artemisia annua and Artemisia afra. More important even is the observation for the total absence of gametocytes after 7 days treatment with the herb. A tremendous hope for malaria eradication. The results have been communicated to the local health authorities, and to the Ministries of Health and Research in the RDCongo who were supportive of these trials. The draft of a paper is almost ready and will be submitted to a peer reviewed scientific journal. Die Artemisia-Pflanze hilft möglicherweise weit besser gegen Malaria als das auf diesem Kraut beruhende Medikament. Eine US-Studie an Mäusen zeigt, dass die zermahlenen Blätter der Pflanze die Malaria-Erreger eher abtöten als die Arznei. Nach der Einnahme tötete das Naturprodukt in den Tiere im Zeitraum von 12 bis 72 Stunden deutlich mehr Parasiten ab als reines Artemisinin – bei gleichem Wirkstoffgehalt. Die Forscher führen dies zum einen darauf zurück, dass nach Gabe des Pflanzenmittels im Vergleich zum Pharmaprodukt etwa 40 Mal mehr Artemisinin im Blut der Tiere zirkulierte. Zusätzlich verweisen sie darauf, dass in den Blättern der Pflanze neben Artemisinin auch andere Substanzen vorkommen, die gegen Malaria helfen. Artemisinin is a natural compound obtained from the plant Artemisia annua. The ancient records of Greek medicine speak of the use of Artemisinin due to its amazing therapeutic properties. The Chinese medicine shows a rich history of the use of Artemisinin through the ages for the treatment of various conditions. In the recent years, further researches have unearthed the remarkable curative effects of this wonder drug. Artemisinin is basically a sesquiterpene lactone obtained from the extracts of the herb Artemisia annua. Artesunate is a water soluble semi synthetic derivative form of Artemisinin. Chemically, Artesunate is a succinate esterified dihydroartemisinin. Other derivatives of Artemisinin include Artemether and Dihydroartemisinin (DHA). These compounds have been demonstrated, through rigorous clinical trials, to possess a myriad of medicinal properties. These include anti-malarial, anti-bacterial, anti-fungal, anti-viral, anti-parasitic, anti-allergic and anti-cancerous effects. The anti-viral properties of Artemisinin and Artesunate are well-known. The earliest records are available in the Chinese medicine that speaks of anti-viral activity of Artesunate against the influenza type A virus. These anti-viral effects are broader and more potent in Artesunate as compared to any other derivative of Artemisinin. It has the potential to act against a wide range of viruses including members of Herpesviridae family like herpes simplex virus type 1 (HSV-1) and Epstein-Barr virus(EBV), human cytomegalovirus (CMV), hepatitis B virus (HBV), hepatitis C virus (HCV), and bovine viral diarrhea virus. The spectrum of activity of Artesunate includes both DNA and RNA viruses. One of the first researches to be held on the anti-viral effects of Artemisinin demonstrated its effectiveness against the Cytomegalovirus (CMV). It is known to inhibit the replication of CMV within the body. The mechanism that was proposed for this action of Artesunate stated that it inhibits the regulatory mechanisms of the cells that are inhabited by the CMV thus interfering with the metabolic requirements of the virus and preventing its further replication. The drugs that are currently used against CMV are all associated with various levels of toxicity and have the major drawback of the emergence of resistance in the virus strains against them like ganciclovir. Artesunate is a novel drug that has overcome the problem of drug resistance in viruses. Artemisinin and Artesunate also show wide spectrum of activity against all the subtypes of the human herpes virus, particularly the Epstein Barr Virus (EBV), human herpes virus type 6A and the herpes simplex virus type 1 (HSV-1). It has been clinically proven that Artesunate is more effective in controlling herpes viruses as compared to the parent compound Artemisinin. A study conducted by Milbradt, Jens, et al. in the year 2009 explored the mechanism of anti-viral activity of Artesunate against the Herpes Virus types. Various cultures of human cells were taken and Human Herpes Virus type 6 (HHV-6) strains were made to enter these cells. This was done to evaluate the limit to which Artesunate can inhibit the viral replication by the help of immunofluorescent techniques. It was observed that when the cells were treated with Artesunate, the drug caused inhibition of the protein synthesis phase of the virus thus inducing apoptosis and later, necrosis in the cells. It was also observed that increasing the amount of the drug increases the anti-viral effects. In this way, the anti-viral activity of Artesunate against Herpes Virus was proved and has been declared to be an effective remedy for HHV infections. Against the Hepadnaviridae virus family, Artemisinin and its compound Artesunate have been shown to be particularly effective. This family contains the infamous Hepatitis B virus (HBV). It is important to keep the HBV in check as it ultimately leads to the development of malignancy in the form of hepatocellular carcinoma (HCC). The lack of effective remedy against this virus makes the role of Artemisinin and Artesunate significant. They cause the inhibition of the DNA replication of HBV. An important point that was noted was the absence of toxic potential for the normal liver cells which is in sharp contrast to other drugs available for the treatment of HBV as they tend to damage the normal liver cells too in addition to the destruction of the virus. Artemisinin and Artesunate are also beneficial against the members of the Flaviviridae family, the most important of which is Hepacivirus (HCV). It is another common risk factor for HCC to develop. The presently available medications for HCV are also not as effective as Artesunate. The drug is known to inhibit the DNA polymerase and prevent the virus replication (Efferth et al; 2011). Against the human immunodeficiency virus (HIV) that causes AIDS, Artesunate has been shown to cause partial inhibition of the strains and prevent its replication. A meta-analysis was held that established the efficacy of Artesunate in combating the BK and JC types of human polyomavirus. Further anti-viral assays show that both DNA and RNA viruses are affected by Artesunate and its parents compound, Artemisinin and this activity is quantitative, that is, slowly enhancing the drug dosage augments its effects. The polymerase chain reaction (PCR) assays have also confirmed these effects. Artesunate has been shown to inhibit various DNA sequences especially at the primer regions of the viral genome. This lends Artesunate its main anti-viral role. It has also been validated that these anti-viral effects are totally irreversible and cannot be overcome. No records of resistance in the virus strains againstArtemisinin and Artesunate have been made as yet which makes these drugs an effective cure of various sorts of viral infections. The in vitro and in vivo anti-viral effects as well as the extremely sensitive and specific nature of Artemisinin and Artesunate against specific virus types have been a subject of extensive investigations. Further researches are under way so that the full pharmacological attributes of Artemisinin and Artesunate, as well as other derivatives, can be discovered so as to find the full range of viruses that are vulnerable to these compounds. The day is not far when Artemisinin and its compounds will become the drug of choice for the treatment of viral infections. 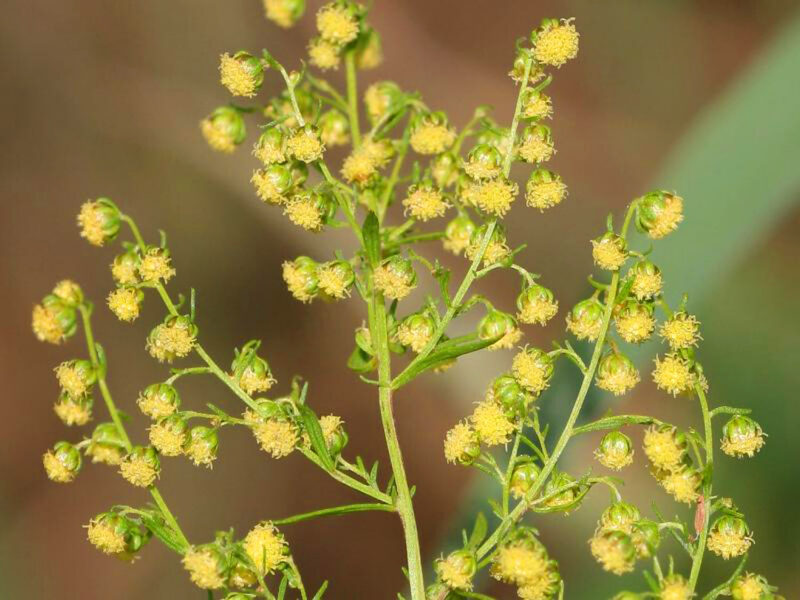 Artemisinin, a natural compound from the sweet wormwood (Artemisia annua), has been found to potentially aid in the treatment of tuberculosis. The study was led by Michigan State University researcher Robert Abramovitch and was published recently in the journal Nature Chemical Biology. Artemisinin is derived from the sweet wormwood (Artemisia annua) and is highly effective against drug-resistant malaria. Image credit: Kristian Peters / CC BY-SA 3.0. The compound is a potent anti-malarial agent, and can kill highly drug-resistant strains. In the new study, artemisinin stopped the ability of Mycobacterium tuberculosis (Mtb), the causative agent of tuberculosis, to become dormant. This stage of the disease often makes the use of antibiotics ineffective. “When Mtb are dormant, they become highly tolerant to antibiotics. Blocking dormancy makes the bacteria more sensitive to these drugs and could shorten treatment times,” Dr. Abramovitch said. Mtb needs oxygen to thrive in the body. The immune system starves this bacterium of oxygen to control the infection. Dr. Abramovitch and co-authors found that artemisinin attacks a molecule called heme, which is found in the Mtb oxygen sensor. By disrupting this sensor and essentially turning it off, artemisinin stopped the disease’s ability to sense how much oxygen it was getting. “When the Mtb is starved of oxygen, it goes into a dormant state, which protects it from the stress of low-oxygen environments. If Mtb can’t sense low oxygen, then it can’t become dormant and will die,” Dr. Abramovitch said. The researchers indicated that dormant Mtb can remain inactive for decades in the body. But if the immune system weakens at some point, it can wake back up and spread. Whether it wakes up or stays ‘asleep’ though, Mtb can take up to six months to treat and is one of the main reasons the disease is so difficult to control. After screening 540,000 different compounds, the authors also found five other possible chemical inhibitors that target the Mtb oxygen sensor in various ways and could be effective in treatment as well. The research could be key to shortening the course of therapy because it can clear out the dormant, hard-to-kill bacteria. This could lead to improving patient outcomes and slowing the evolution of drug-resistant Mtb. Data from clinical studies and population modelling suggest that coadministration of lopinavir/ritonavir and artesunate or artemether decreases exposure of dihydroartemisinin (the biologically active metabolite) by ~40-60%. Further studies are required to determine the clinical significance of this reduction and if dose modifications are required.